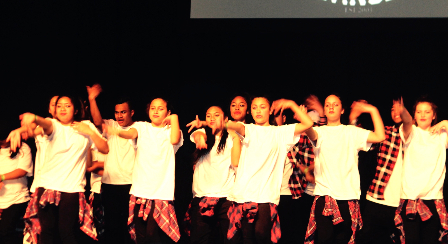 Students approached staff earlier in the year to seek support for entering the Bring It On Dance competition. Mr Tonks, Ms Allpress, Ms Fletcher and Mr Lagaaia all offered to support the group and supervised their lunchtime and after school rehearsals with Mr Tonks liaising with the Bring It On school tutors and the parents. The students developed a concept for the dance, selected the music, choreographed the sequences and decided on the costume style for the group. On Saturday September 5th the group met at school for a final rehearsal. Spirits were high as they loaded gear into the school vans and headed off to the Vodafone Events Centre where the afternoon was spent rehearsing and preparing for the live performance. The atmosphere back stage was quite electric with teams from eight schools revising their formations, refining the routines and finally getting into costumes ready for the call to be seated in the arena. There were six schools competing in the secondary division and Lynfield was first to hit the stage. They performed with enthusiasm and energy, clearly showing the audience how much they enjoy dancing. After their performance the group could then sit back and enjoy the routines of the other competing schools. 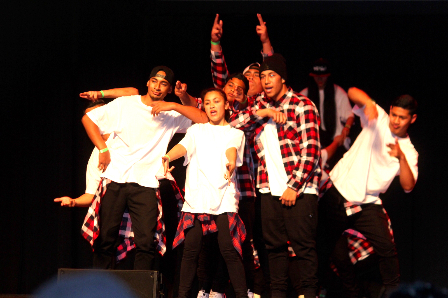 A special presentation from The Bradas – NZ World Hip Hop Champions -added to the excitement of the evening. The build up to the announcement of the winning teams was tense with massive cheers from the huge crowd when Mangere College were announced as top team for 2015. Although Lynfield was not placed, the experience of participating and following through on their dream to compete was a reward in itself. All the students were really excited and proud of their achievement. They are the first team in a long time to represent Lynfield in this competition, and have led the way for teams to participate in the future. Special congratulations are due to Noa Tagicakiverata for his leadership role that involved ensuring rehearsal spaces were booked and students received the letters and information sheets to take home to parents. Elena Euese and Peya Ono are also to be congratulated for their tireless work in organising the team, refining choreography, along with Michael Evaga, and finalising decisions around costuming. Tj Fainu’u showed patience and skill working with the boys refining their moves and perfecting timing. What is remarkable about this team is that the students participating were a mix of male and female students spanning Years 9 through to 13, with the bulk of students coming from Year 11. This bodes well for the future as the students develop their physical skill, creative ability and deepen their appreciation of the Hip Hop genre. Special mention must be made of international student Martina Izzo from Italy, who committed herself fully to this group and shone as an outstanding performer.